����������� Our EKG monitoring instrument uses the Atmel Mega103 microcontroller to control and store the data acquired via EKG monitoring systems involved.� Our primary objective is to accurately measure the electrical activity of heart with EKG monitoring instrument.� This is achieved by building an instrumentation amplifier which is specifically designed for bio-electrical signal measurement.� In addition, two active filters � one high pass and one low pass � were employed to eliminate measurement errors.� The high pass filter was used to remove any dc drift with cut-off frequency of 0.2Hz, while the low pass filter was used to eliminate anti-aliasing effects.� More detailed hardware designs are described below. ����������� User input from the PinD0 initiates the data acquisition process. Once initiated, the signal acquired via EKG monitoring instrument goes through the Analog to Digital Converter of the microcontroller at sampling frequency of 720Hz and this data is stored in external SRAM.� Upon completion of data acquisition process, the user can initiate transmission of the stored data via the Hyperterminal to be interfaced with Matlab.� Data can be further analyzed with Matlab software for future studies, such as RR interval analysis, QT interval analysis. 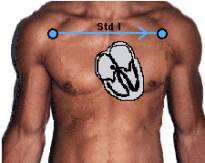 When detecting and recording the EKG signal, there are two main issues of concern that influence the fidelity of the signal.� The first is the signal to noise ratio.� That is, the ratio of the energy in the EKG signal to the energy in the noise signal.� In general, noise is defined as electrical signals that are not part of the wanted EKG signal.� The other is the distortion of the signal, meaning that the relative contribution of any frequency component in the EKG signal should not be altered.� To meet the above conditions and requirements, a design for the amplification system proposed as shown below. Two bipolar leads shown on the left (i.e., they detect a change in electric potential between two points) detect an electrical potential change in the frontal plane. 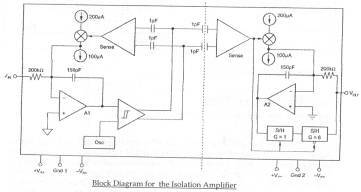 Instrumentation Amplifier - increases the signals by a factor of up to 10000. 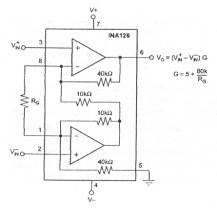 Operational Amplifier - High-Pass Filter removes DC base line drift by cutoff anything below 0.2 Hz. Isolation Amplifier - intended for safety precaution.� This transmits the signals optically, thus isolates the circuit from the patient. Low-pass Filter accounts for Anti-aliasing effect. 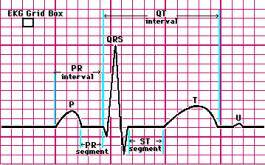 The figure displayed on the left illustrates distinctive sections of EKG signals. All components were powered by one 9V battery thus making the EKG monitoring system much more safe. ����������� The ISO124 isolation amplifier uses an input and an output section galvanically isolated by matched 1pF isolating capacitors built into the plastic package.� The input is duty-cycle modulated and transmitted digitally across the barrier.� The output section receives the modulated signal, converts it back to an analog voltage and removes the ripple component inherent in the demodulation. 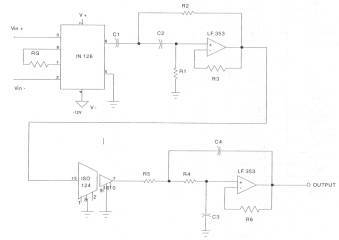 The low pass filter was designed for a cutoff frequency f = 1000Hz. 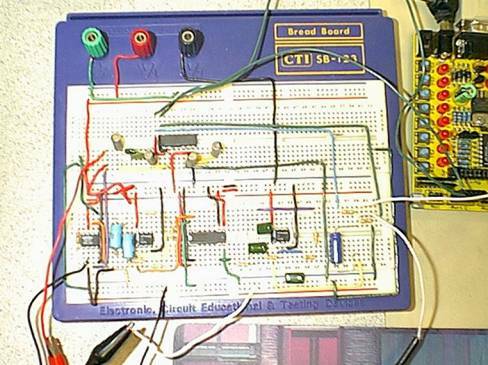 Software � Since we were using Atmel�s Mega103 microcontroller, we were able to support external SRAM as well as the A/D converter. The EKG output was inputted into the A/D converter, where A/D conversion complete-interrupt was used to store the data into our array.� The program starts taking the data when PIND0 is pushed.� Using timer 2 overflow interrupts, we were able to gain data acquisition of 720 data points per second.� The program constantly takes data until a character is received through the UART signaling that the computer is ready to receive the data, or the external SRAM runs out of space.� When the computer is ready to receive the data, we print out the data to the hyperterminal screen where the text can by captured by the hyperterm.� The data is then plotted in MATLAB. Things we would do differently next time - One of the things that we found out too late is that even though printing out the data is easier to code, it will take much time for us to print out all the data on to the hyperterm.� It did not hit me until too late that printing out that much data will take time.� We have tried to work with the XModem protocol as originally suggested, but I could not figure out why the CRC check was not functioning correctly.� Another thing that we neglected to do while trying to figure out the XModem protocol was that we did not put in a reset function for the code. ����������� The EKG monitoring system performed very well.� The graph shows Matlab display of the acquired EMG signal at 360Hz after the A-D conversion process.� The bicep muscle was flexed approximately at 1Hz. - Due to the size limit of RAM, the acquired signal can only be stored for approximately 2 minutes.� We would like to attach a storage device, which would enable us to store the data for more then six hours in the future. - Data transfer is currently performed through two-step process.� Once all data is displayed through hyperterminal, the result is saved as a text file, which later would be loaded into Matlab.� This is a cumbersome process and we would like to export the data directly by using data acquisition system, provided in Matlab. - Most commercial EKG monitoring system has more then one channel to acquire EKG signals.� We would like to add multiple channels to the circuit for future use. - The current sampling frequency is set to be 720 Hz. However, we would like improve this by adding a User Interface that would allow adjustable frequency in the future. � //main task scheduler loop -- never exits! � //86.8 x (64x.25) microSec = 1.39 mSec, so prescale 64, and count 87 times. � TCNT2=reload;�� //preload timer 1 so that is interrupts after 1 mSec.